Just this month Commonwealth Bank became one of the first Australian banks to start using location-based marketing through Facebook giving away a year’s worth of free movie tickets to anyone who opened an account with the bank after “checking in”. The offer was available to the first 2,200 customers and expired within weeks. Gone are the days of broadcasting through Facebook – raving about new products, pushing news stories. Just as our friends don’t care when we boast, we’ve come to realise our Facebook fans don’t either. Facebook has developed into an important communication tool for businesses and the better we understand its fundaments the better we can utilise it. The opportunity Facebook presents to connect with our customers is enormous. With just the click of a button we can engage a new audience and interact with existing customers in new and exciting ways. But with the amount of posts generated each day we need to produce engaging content to be noticed. We need to use Facebook as added value to have consumers create a connection with the brand – customers won’t react if we don’t excite them. We need to be fun, creative and respond to their needs. Think about what your customers are interesting in. We should be offering our customers something extra that they can’t get elsewhere. Creating a resource is a great way for customers to engage with our brands – providing information and tips on how to use our products and services, for example. Understanding that small business owners buy computers Dell created a social media resource so small business owners interested in social media keep Dell top of mind. Give fans teasers in the lead up to a product launch, exclusive information or a sneak peek. We’re not all good writers so be fun and creative. Use engaging materials like video blogs, photos and interesting links. Offer contests and coupons exclusively to Facebook users. Invoke responses by asking questions (questions at the end of posts are likely to generate a better response). Utilise the opportunity to listen and interact with customers. Listen and learn about your product, how customers use it and how it’s perceived. Try to respond to all customer questions and comments and facilitate conversation but remember you can’t change what they think. 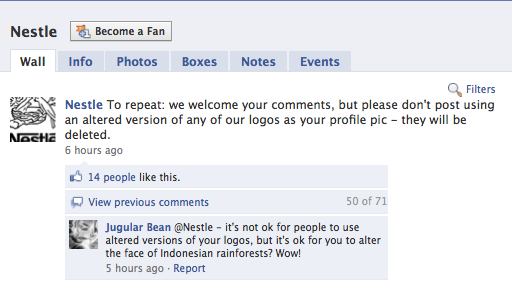 We only have to go back a year to Nestlé’s palm oil social media debacle to see why. Keep messages clear and concise – shorter posts have a higher engagement rate. Words like “winner”, “win”, “event”, “special”, and “offer” will resonate well if running a promotion. Requests to “like”, “post”, “comment”, or “tell” us something improve our chances of engagement. 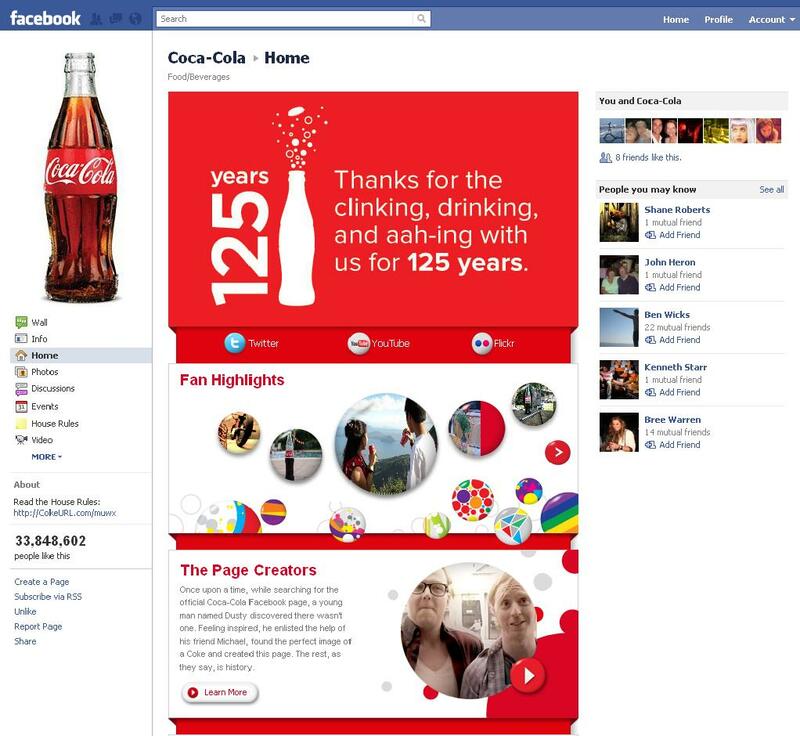 Coca-cola runs innovative promotions and fun, interactive features and has been great at encouraging its 33+ million fans to leave comments, photos and videos on its page. 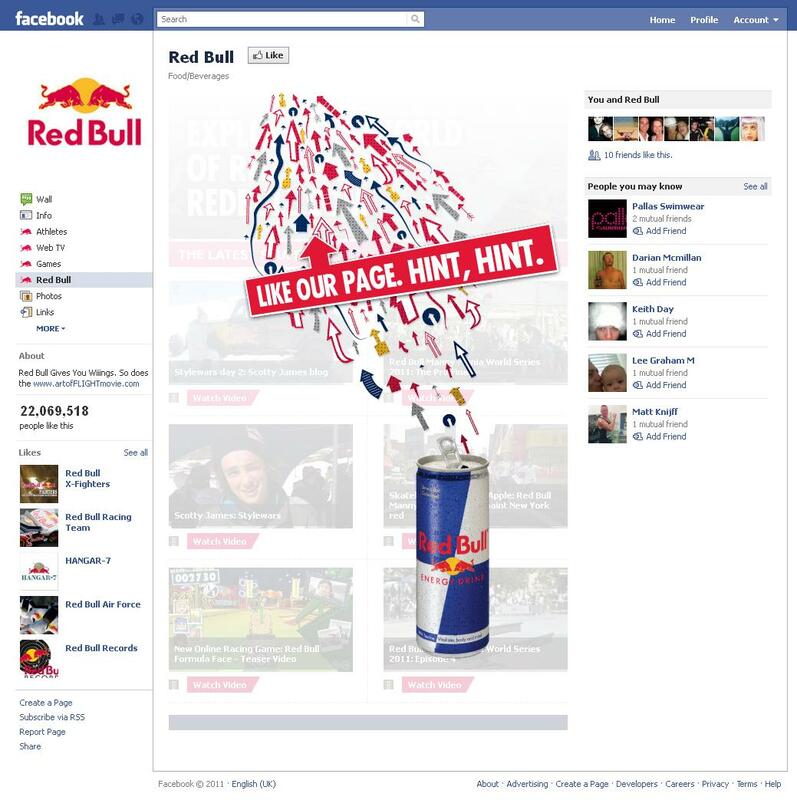 When a non-fan lands on Red Bull’s page, they’re encouraged to “Like” it with an attention-grabbing image straight away. The team behind the page is extremely in tune with Red Bull’s target audience and creates custom apps and unique content. Competitions and games are a great way to engage fans and Skittles does this well. 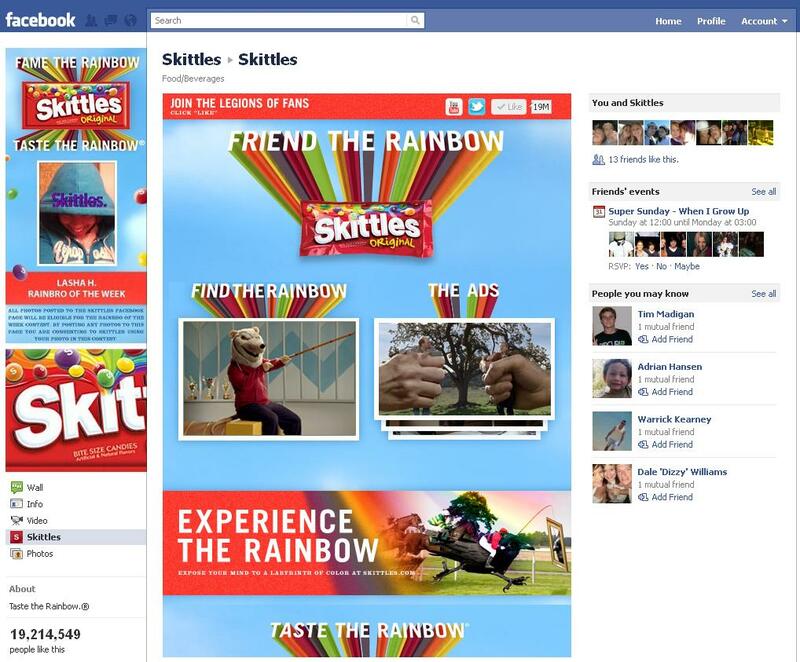 “Fame the Rainbow”, which puts a fans face as the profile pic for a week, does this well and is consistent with the brand. Creating a Facebook fan page for your business is simple, but getting it well established with customers takes time and planning. You can’t expect to have a huge following overnight. Content is key – be creative and interesting and make it easy to share or participate in.